Their best album ever, "In Heat" contains only seven songs and runs only 30 minutes. but it leaves you wanting more. The only song which can be considered a "bum cut" is "I Love You So, Never Gonna Let You Go". The album kicks off with a great uptempo song, "Move Me No Mountain" (also recorded by Dionne Warwick and Chaka Khan), followed by one of the best ballads ever, "Share A Little Love In Your Heart", which only briefly charted on the R&B charts, but is a sumptuous song. Then comes the "side one" closer, a ray of mid-tempo sunshine with the unwieldy title of "Oh I Should Say, It's Such A Beautiful Day". "Side Two" opener (track four on the CD) goes temporarily into overdrive with "I Needed Love - You Were There", a great song which cooks all the way through. 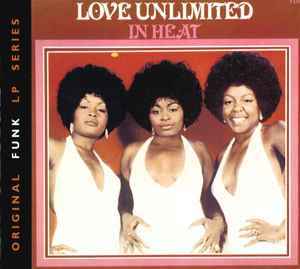 Next up is Love Unlimited's only #1 hit (on the R&B chart), a beautiful declarative ballad, "I Belong to You", which melds a new song to the intro of a six year old tune, "Lost Without the Love of My Guy" by Viola Wills (which was also written and produced by Barry White - his wife Glodean coerced him into writing the group a new song with that intro, as the record had been a favorite of hers). After the aforementioned "I Needed Love..." comes a surprise - a newly orchestrated and recorded VOCAL version of "Love's Theme". Throughout the album, the girls' vocal pyrotechnics are absolutely blazing, these songs inspiring them to new heights which, unfortunately, they never again reached. This is the album which should have gone top 3 on the Billboard charts, being quite superior to their "Under the Influence of Love Unlimited" album, but that one had the original instrumental "Love's Theme", which was a #1 Pop hit, selling it. It's VERY expensive as an import, upward from $30.00 (and it seems the demand is there - why hasn't it been issued on CD in the US? ), but for a great example of beautifully orchestrated mid-70s soul, "In Heat" cannot be beaten.